Finally! I've got a new look, a new name and a new blog at www.CindyEdelstein.com. I'm so excited! Expect a lot more content and please don't be shy to comment or ask questions on the new site. CindyEdelstein.com offers a lot more information on the rest of our projects and events, too. So much to share! I hope you join me there. At the JA NY Winter Show a few weeks ago we had a great time organzing a High Tea for editors and industry VIPs. It was a great event where over 70 Couture show designers debuted their new Spring Picks for the crowd. Most of the items were on display for the editors while many more were in the handout. Couture and the Couture Pavilions is the destination for high-end jewelry design and is the perfect confluence of the best brands shopped by the best retailers in the best environment. Colored diamonds were also seen often -- browns, champagne, pink, yellow and some greens and blues, too! The Natural Color Diamond Association brought along a great collection that showcased simple little stud earrings all the way up to major society jewels in all the warm shades. Rob May of NCDIA gave a great talk, too, about the emerging trend for color in diamonds. 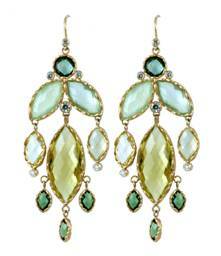 earrings by Shaesby -- cool colors and great dangling scale!